The features of the card: the thickness or weight, the commercial standard formats most popular and most common types of paper. Learn more about the main characteristics of the Prince of typography: the paper. The thickness (or weight), the main standard commercial format and types of paper and cardboard more common. The multiple paper types on the market require us to a number of classifications to be able divincolare in the vast world of the paper material. The first parameter to consider when choosing a card is its thickness, in more technical terms, although in reality it is another parameter and measurement system: the weight. The basis weight of a paper expressed in grams per square meter, while not being a direct consequence usually a heavier paper is also thicker. the cartoon, the cartoon category includes all printed materials of a weight exceeding 360 g. / m2. 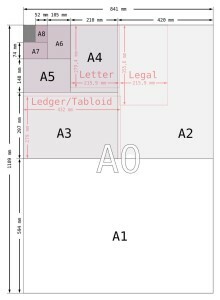 The standard sizes of commercial paper. During the last century it was found necessary to standardize the size of the commercial paper, from this need were established in international standards known as ISO 216. 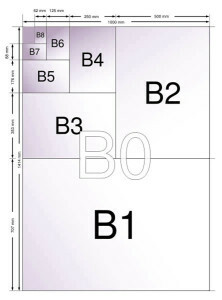 ISO 216 refers to the standard DIN 476, this German standard has as an initial format sheets of paper of 1 square meter of the size of 84,1×118,9 cm., The measures below are obtained ideally by continuing to cut in half the square meter of paper on its longer side, so as to obtain the various A1, A2, A3, A4, A5 etc. etc. The standard format of most marketed retail remains the A4, the typical size of writing paper to be printed in the most common office printers. Less common but still worth mentioning are the standard formats of the series B and C, which are still the most popular source format to ISO 216. Inquest page tables some examples of standard formats is commercial encyclopedia Wikipedia. The main types of paper. Typography Vittoria, being in contact for direct contact with major domestic and international paper mills, has ability to find virtually any type of paper material on the market. In this study we will just list but the main types, the most commonly used in our printer. gloss coated paper and matte, the coated paper is achieved by creating a chemically coating the surface with minerals, such as kaolin and calcium carbonate in aqueous solution. In the market there are two solutions coated version shiny and matte. The coated paper is well suited for creating flyers, leaflets and brochures. The coated paper when compared with other cards is that in relation to the thickness has a greater specific weight, this due to the manufacturing method, in the presence of heavy minerals just described above. special papers and boards, in this macro category are dozens of cards, different for both staining, to pasta, to plot and weight. There are special papers and boards hammered into paper, laid, with metal effect and charges say so on and so forth! Italy has a great tradition of paper of the highest order, just to name two Italian companies are world renowned as Fabriano (Fedrigoni group) and paper mill “Cartiera Garda”.